To your, the graffiti as a part of street art culture wasn’t invented in the times when the hip-hop appeared on the surface. If we look at the matter in details, this thing is older than the urban civilization. Humans drew and scratched the walls of the caves they have lived in for tens of thousands of years before the first ever settlement was built. But let’s skip the pre-historic part and the ancient too and start the history review from a more recent era. Still, we trace the origins of the graffiti before the hip-hop era. Getting back to the early 20th Century where the majority of the population was already living in the cities this where the drawings on the wall started to make sense and to form a whole sub-culture in the urban areas. It wasn’t just to scratch an obscenity on the wall, it was about leaving something that is meaningful to you and might be meaningful to other people. 4The phrase „Kilroy was here“ might not ring bells now but it was incredibly popular in the times after the World War II representing the US troops presence on different spots on the globe. In New York graffiti have been noticed in honor of one Afro-American music icon which had nothing to do with the hip-hop – the words „Bird Lives“ served as a way to pay respect to the late jazz musician Charles Parker who died only 35 old in the 50s. As the 60s turned the world upside down, it was the electric guitar music that turned to a mass hysteria that propelled a wide spectrum of sub-genres and sub-cultures to emerge and develop. As with Charlie Parker case in NYC, it was worshipping a musician that made the graffiti noticeable in London – „Clapton is God“. Anti-establishment uprisings in the next decade known as the Punk era increased the prominence of the drawings and slogans on walls, especially with the extensive use of the aerosol paints. But then it was the hip-hop after all that made the graffiti a trend of art on the top of the social act after all. It literally happened that way – the expansion of the graffiti culture used the subways as one of the main types of areas. Abandoned urban areas, bridges, and even industrial buildings served as a „canvas“ for the growing number of spray artists. The rap music started to become widely associated with the drawings which evolved significantly in size, colors, and content. The volume to which the graffiti culture rose in presence and influence was showed by the 1983 movie called Style Wars. It was among the first to discuss the antagonism between the wall drawing lovers and the ones who considered it vandalism rather than an artistic expression. Later on, the hip-hop ecosystem became too small to hold the grip on the urban culture of street art even if it is still largely linked with it. Pop icons of the cartoons like The Simpsons started being drawn everywhere. The 21st century rose to a worldwide prominence the graffiti artists such as the legendary Banksy, for example. The more the street art expanded and evolved, the further it reaches influencing various aspects of everyday life. 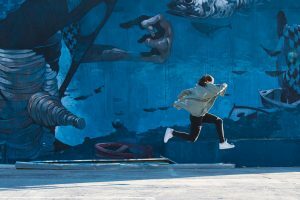 The wall paintings are increasingly recreated in fashion and mass culture and thus are embraced by an uncountable number of people most of which happen to be largely unfamiliar with the origins of the graffiti. Commercially nowadays we can see examples of the street art all around us. Probably, the first use of such style was employed by small shop owners who preferred to merge with the wall pictures by adopting them rather than washing up the storefront all the time with no substantial result. 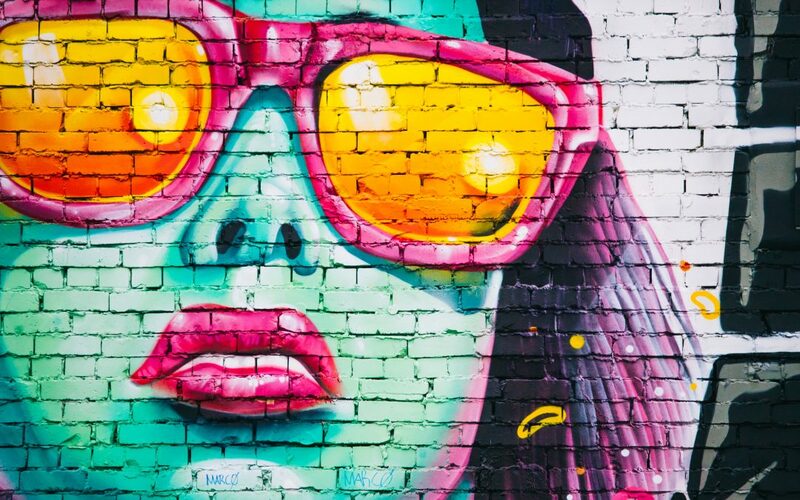 Today we can see the whole branch of clothing lines using the street art imagery and style to make the outfit more colorful and interesting. And it wasn’t only the kids who went crazy for the T-shirt with the graffiti-like scripts and signs on them. Holywood stars, rock and pop singers also embraced the idea. The images and the style of the letters appeared not only on shirts but also on pants, jackets, backpacks, sunglasses, and so on. Another field where the graffiti became increasingly popular is the car paint mastery. While the clothing lines actually twist the street art somehow by serving the skills of anonymous underground painters to the mass industry, the vehicle oriented art continues to be largely custom made. And it is definitely much more expensive – putting a regular new paint on the car costs hundreds of dollars, so the graffiti reasonably turn to be higher in price. 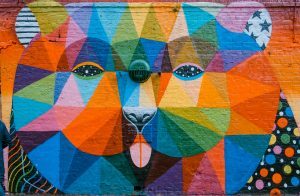 Started as the method of self-expression and developed as counter-culture, nowadays the street art is the mainstream or is closely linked with it. Fashion trends change but the presence of the graffiti does not seem to wane in the urban scenery and everyday life. 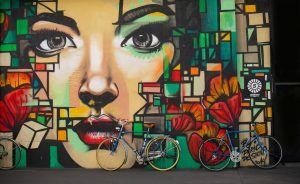 Do you like street art and have you ever been involved in such? Thank you darling! We love you!